We support a number of Christian missions and organisations as we desire to fulfill our Lord's command to "go into all the world and preach the gospel" and to "heal the sick" meeting the needs of people as we are able. Where available, links are given to provide further information about the organisations. 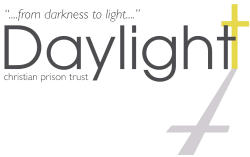 Daylight works to share the Gospel of Christ with prisoners and to support them during their sentence by running chapel services, group Bible studies, writing to individual prisoners and visiting prisoners needing individual support. We work in partnership with prison chaplains across the UK to help prisoners maintain contact with the outside world so that they are better able to readjust to life on the outside after release. The Middle East Reformed Fellowship (MERF) is an evangelical Christian missionary organization which serves in the Middle East, North Africa and Asia on behalf of Reformed and Presbyterian Family of Churches and believers worldwide. "Our work is bearing fruit for the Kingdom of Christ among the twenty-two nations of the Arab League and other Muslim areas in Africa and Asia." MERF strengthens national churches with ministries of evangelism, church extension, biblical training, and diaconal aid. The European Mssion Fellowship (EMF) champions mission in Europe by planting and nurturing local churches. "We connect churches and individuals to support a growing network of church planters, pastors, leaders and workers. We also provide a Bible-centred training programme." The situation for many people and especially for children is desperate in parts of Sri Lanka. They have suffered from many disasters including the 2004 tsunami, flooding and droughts and the aftermath of the conflict that raged for many years. In addition, some Christians suffer from persecution and discrimination. Formerly, support for needy believers and children in that land was channelled via an organisation called "Children for Jesus" until that work closed in 2007 and now support is sent to "Lanka Evangelical Fellowship of Churches" via	Belvidere Road Church in Liverpool or to "Care Sri Lanka" . The AEM supports missionaries and local churches in Albania, once described as the world's first true Atheist State. Even in the midst of the atheist, communist years, the light of the gospel of our Lord Jesus remained alight and few though they were, believers in that land still held on to their Faith. The Barnabas Fund seeks to raise public awareness of the persecution of Christians throughout the world and to give aid and support to those in such need. Christians suffer throughout the world, many losing their lives simply through professing faith in the Lord Jesus Christ. Some lose their livelihoods and jobs. Others are turned away from the provision of health care or the distribution of international aid. When the list of countries in which Christians suffer persecution is considered, it makes one realise how precious and how relatively scarce is the freedom that some of us enjoy. Pilgrim Homes (a part of Pilgrims' Friend Society) is an organisation providing housing, sheltered accomodation and nursing care for elderly Christians in the U.K. This provision is financed largely by the charitable giving of Churches, individual Christians and fees paid by residents and families who are able to contribute to their care. S.A.S.R.A. work among the soldiers and airmen in the British Forces. The Scripture Readers are themselves ex-members of the Forces and they seek to reach and help members of the Forces with the Gospel of Jesus Christ. Her Majesty the Queen is the patron of SASRA and they are able to visit the soldiers and airmen with the permission of the Chaplains and Commanding Officers.